Book Across the Bay is the upper Midwest’s most unique winter event, open to skiers and snowshoers of all ages and ability levels. The 10-kilometer course, which is groomed for both classic-style and skate skiing, starts in Ashland and ends in Washburn, and follows a route not on land, but over the frozen surface of Lake Superior, the world’s largest freshwater lake. 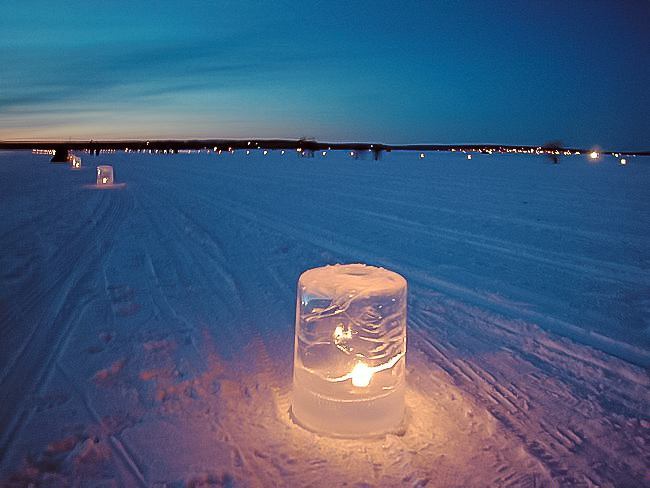 The event is held at night, and the course is lit by the stars above and up to 1,000 candles in ice luminaries that line the entire route. Pre-race Polka Party on the Ashland Side at Maslowski Beach 6-10pm. Everyone is welcome and it’s FREE! Book Across the Bay is starting early again with the Parkhurst Kolonko (PK’s) Polka Party on the Bay! Join your friends and neighbors in the big tent at Maslowski Beach for an evening of old-fashioned fun on the frozen shores of Lake Superior. Come hungry! Andy will be serving up an award-winning Sixth Street Market brats at a steal of a deal and Nancy from the Stagecoach Bar & Grill will be slinging beer and wine for those 21 and older. Nancy Carey Mullenbrock ’78, as the naming sponsor for this event, chose to dedicate this fun community event to Marlene Parkhurst and Louis Kolonko, who each played a role in providing education on dance and music at Northland College. Race-day check-in, Bib pick-up and race-day registration will be held from 11am to 5pm on race day, February 16th, at Thompson’s West End Park, 401 South 8th Ave. West, in Washburn (finish line for the race). Register your kiddos for the Kids’ Book It Fun Race on Lake Superior, Saturday morning before Book Across the Bay. Book It is a FREE, fun, race for children 12 and under. Registration and Bib pick up for Book It will be at Solstice Outdoors starting at 10am. The race starts at 11am for 8-12 year olds and 11:30am for 8 and under. All participant will receive a commemorative medal, hot chocolate, and cookies! Questions please call 715.682.3590. Shuttle will be running from 1-5pm, from Thompson’s West End Park, 401 South 8th Ave. West, in Washburn (finish line) to the start area at Maslowski Beach in Ashland. There will be a big heated tent set up at the start area with events and activities going on there all afternoon. We urge you to park in Washburn and take a shuttle to the start. There will be little to no parking available at Maslowski Beach. Race Day pre-race activities on the Ashland side in the tent at Maslowski beach. Free admission and Family friendly! The Post-Race party will be held at the tent at Thompson’s West End Park, 401 South 8th Ave. West, in Washburn and will get underway around 7pm with “Fido and the Love Dogs”. Admission is FREE for participants, however a suggested donation at the door for non-racers of $5. At the post race party: chili, hot dogs, beer by South Shore Brewery, and our “Book Store” will be open for BATB merchandise!